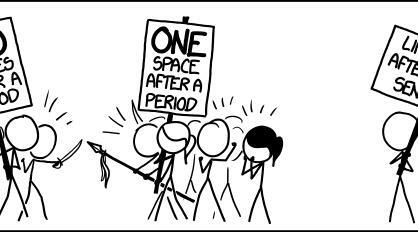 Should periods be followed by one space, or two? Periods that end a sentence should be followed by one space, not two. Some forms of technology expect users to use a single space. Major style guides recommend one space. No mainstream sites or publications use two spaces as their standard. Besides in English, grammar also requires one space after period in other languages too, such as Italian, Spanish, French, etc. Two spaces are less aesthetically pleasing. Using a single space is more efficient. Using two spaces after a period improves readability. Since two spaces distinguish sentence-final periods from other types of periods, using two spaces encodes more information than one space and is therefore the better convention. Anything that helps the reading eye comprehend the written material is worth doing. There is a noticeable correlation between age and two space periods. Two spaces was convention for mechanical typewriters and the continued usage could be explained by decades of muscle memory. Using two spaces after a period has been the convention. For some forms of writing, the spacing is irrelevant. Should There Be Trigger Warnings in Education? Should Ontario have only one public, secular school system?